They say crime pays, but apparently being a career politician really really pays. Scott Walker, without a college degree and never having met a payroll or even spent a day in the private sector is worth a whopping $2,000,000. Since Mr. Walker is a multi millionaire and career politician, every single dollar he is worth has come from the taxpayers of Wisconsin. Now he is repaying us by traveling he country on our dime. By the way, average teacher salary in Wisconsin is $52,000/yr. Which means if they did not spend a nickel, they would reach Mr. Walker's net worth after forty years of working. Can someone outline how and when his net worth came to be? Who were his benefactors? His pension alone will give him that. His benefactors are the taxpayers. Well, if he paid back the WI taxpayers for the 1.8 million he gave to Menards from the WDC...after Menards gave 1.5 million donation...Walker should be worth what he makes in jail, producing products for little to nothing, and certainly not an "adequate wage". Maybe his wife had money, it worker for Ron Johnson. His wife had money but not that much. 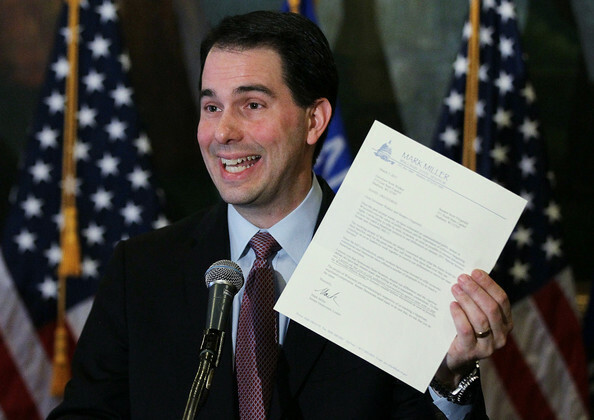 Walker's new found wealth is from taxpayers and his book. Nixon was ethically void but Scott Walker's misdeeds make Nixon look like the real Eagle Scout. I think you are right regarding his book. Usually when these ghost written presidential books are published, right wing groups buy multiple copies to distribute to their friends and members. if there is a royalty agreement, the faux author (in this case, Walker) will get a percentage of each book. That is one way for the groups to funnel money into Walker's pocket. I don't know that that is the case with Walker, but it is a probable scenerio.